It's a dog-eat-dog world in retail right now, as Black Friday sorts the wheat from the chaff. 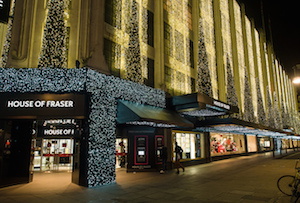 Christmas results from retailers are trickling in and so far they’re from the winners: John Lewis and now House of Fraser. The department store reported record seasonal revenues, boosted by booming online sales and, you guessed, it Black Friday. The chain’s like-for-like sales in the six weeks to January 3rd rose 8%. Online sales jumped 31.2%, although the company, majority-owned by Chinese conglomerate Sanpower since last April, conveniently didn’t give actual numbers, so that could be from a tiny base. Black Friday, meanwhile, was bubblier than, well, bubbly: online sales were 125% higher than in 2013, also smashing the previous daily record by 70%. Retail-watchers have been warning that the US-imported sales frenzy will merely move Christmas shopping earlier rather than boosting it, while also eating into profits. John Lewis boss Andy Street even said he hoped 2014 would be ‘the high water mark for Black Friday,’ despite the chain winning big on the day. But those fears don’t seem to have borne out for House of Fraser at least. Sales in the week before Christmas were up 6.8%, also a record, while its gross cash margin for the whole six week period grew 9.%. For all the manufactured Christmas cheer, though, it’s been a pretty chilly festive season on the high street for some retailers. Fashion chain Bank went into administration yesterday, after so-called turnaround specialist Hilco, which took it over at the end of November, failed to find a way to turn it around. Deloitte administrator Bill Dawson said its 84 stores would stay open and 1,555 staff paid, and that it had already received overtures from ‘several’ interested potential buyers. Still, not exactly the best way to start a new year.